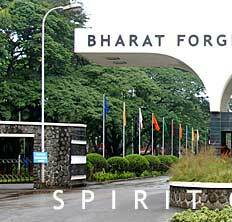 Bharat Forge Limited (BFL), the flagship company of the USD 2.4 billion Kalyani Group, is a true world leader when it comes to delivering innovative auto-component solutions. Since commencement of operations in 1966, BFL has achieved several milestones and is today among the largest and technologically most advanced manufacturer of Forged & Machined components. As one of India’s emerging multinationals, the company has manufacturing operations across nine locations and six countries – 2 in India, 3 in Germany and one each in Sweden, Scotland UK, USA & China. Our customers include the top five Passenger Car & top five Commercial Vehicle Manufacturers in the world. The list includes virtually every automotive OEM and Tier I companies. Backed by a full service supply capability and dual-shore manufacturing model, Bharat Forge provides end-to-end solutions from product conceptualization to designing and finally manufacturing, testing and validation. Bharat Forge is the country’s largest manufacturer and exporter of automotive components and leading chassis component manufacturer in the world. 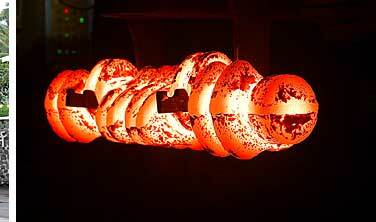 With significant global market share, it is ranked among the leading forging companies in the world. With manufacturing facilities spread over 9 locations, 2 in India, 3 in Germany, and 1 each in Sweden, U.K., U.S.A. and China, the company manufactures a wide range of safety and critical components for passenger cars, commercial vehicles and diesel engines. The company also manufactures specialised components for railways, construction equipment, oil & gas and other industries. Its capabilities to manufacture complex forgings out of both steel and aluminium are a unique feature of BFL‘s competitiveness. We specialize in Closed Die as well as Open Die Forgings. Plain carbon steels like En8, AISI 1045, CK45, ClassIV etc. Our highly professional and technically competent engineers work closely with our customers to extract the best design and produce cost effective and quality forgings. With the latest technology and an ISO 9002 & QS 9000 company, quality control is never an issue as quality procedures are built into EVERY STEP of the manufacturing process. At Bharat Forge, we have ensured that our manufacturing facilities and technical know-how consistently remain at the cutting edge. From world-class design and engineering capabilities to forging facilities. And from best-in-class machining facilities to rigorous inspection and testing. The key to our technological prowess and international acceptance lies in our manufacturing technology. With a global installed forging capacity of 600,000 tons per annum, it also possesses the largest single location forging facility in the world. Our modern forging facilities include over 29 state-of-the-art fully automated press lines ranging from 1600 MT to 16000 MT. 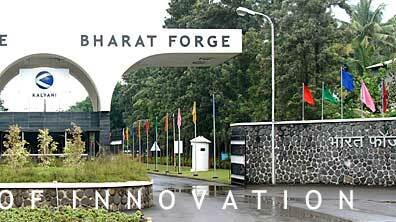 Almost similar to our reputation in forgings, Bharat Forge's machining facilities are world-class and comparable to the best in the industry. Our state-of-the-art machining facility is the largest of its kind and has a crankshaft machining capacity of 650,000 units per annum. In addition, the facility also has the capacity to machine 500,000 Front Axle Beams and 750,000 Steering Knuckles per annum. Bharat Forge's Machining facilities include Crankshaft Machining, Front Axle Beam Machining, Steering Knuckle Machining, Oil and Gas Sector Machining. The facility is supported by well-equipped and modern Tool Room, Standard Room, Metallurgical Lab and Design & Process facilities. And added to these are our flawless Inspection and Testing facilities that further take manufacturing standards to levels of excellence. BFL now has a fully integrated facility with capabilities in Design & engineering, die & tool making, forging a wide range of products, machining and testing & validation. BFL is the only forging company in India to have this capability for a complete range of engine & chassis components. This enables BFL to offer full service supply capability to its global OEM & tier I customers. Its customer base includes virtually every global automotive OEM and Tier I supplier. Daimler Chrysler, Toyota, BMW, General Motors, Volkswagen, Audi, Renault, Ford, Volvo, Caterpillar - Perkins, Iveco, Arvin Meritor, Detroit Diesel, Cummins, Dana Corporation, Honda, Scania and several others source their complex forging requirements including machined crankshafts, front axle beams and steering knuckles from Bharat Forge.